I was ignorant when I began to plant my garden and I chose plants on the basis of passion. After a while I discovered that quite a few of the plants I had selected possessed thug-like qualities. You know the ones. They take over, pushing, shoving and choking out the plants that are more graciously behaved. If left unchecked, these aggressive plants can take over an entire border. They remind me of people that talk incessantly, only happy when hearing their own voices. As I age, I want to be with plants (and people) that don’t need to dominate. Apparently, we all have to go through the phase of falling in love with a plant and then realizing, usually too late, that it’s not the plant we thought it was. My gardening friends all seem to have their own list of thuggish plants. Here are a few of my troublemakers that, if I planted a new garden today, would definitely not be included. Geranium phaeum (dusky crane’s-bill, mourning widow or black widow): I have literally ripped this plant out by the thousands and it still comes up in my garden every year. I even have a hedge of it where I never planted it. Gooseneck loosestrife (Lysimachia clethroides): A gardening friend with a 40-year-old garden chuckled and told me I was “brave” to plant this as we strolled round my garden. Her joke was lost on me. As far as I knew then the plant was well behaved. Her laugh haunts me now. The plant has crashed through my garden like a feral dog on amphetamines. It has a strange pink and white root system that is easy enough to pull out, but if you leave any, and I mean any, part of this root behind it starts spreading again. After 13 years in this garden, I have a substantial list of thugs. Plants that spread by root are not the only ones that can take over; overnight the “self seeders” will reap havoc on a garden. Each spring I set myself the task of eradicating at least one or two thugs from my garden. Alchemilla mollis (‘Lady’s Mantle’) is certainly no lady. She has taken over hundreds of feet of my borders, inserting her clannish offspring into every nook and cranny. I didn’t mind at first, the sprays of chartreuse flowers are lovely, but I had no idea that this plant’s determination to reproduce included growing in hardpan soil and gravel. A friend recently defined a bore as someone who cannot go off topic. 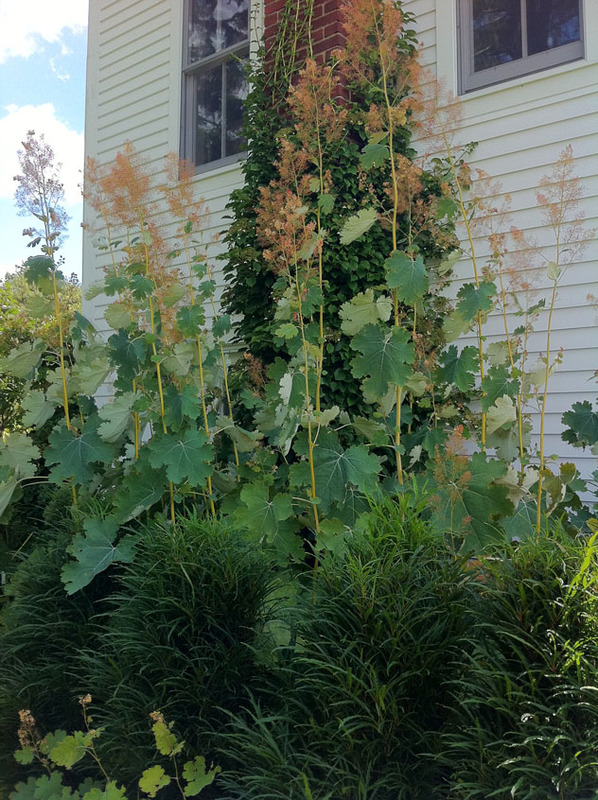 Plume poppy (Macleaya cordata) is a bore because where it resides nothing else can. Because of this plant’s imposing six- to eight-foot stature, I put it at the back of the border, but in no time it had moved itself to the front. Eventually, I yanked it out of several borders and put it into a hedge of Rhamnus ‘Fineline’ where the wonderful broad leaves look great juxtaposed to the texture of this hedge. Never again will I risk planting it with other plants as it doesn’t know how to behave. 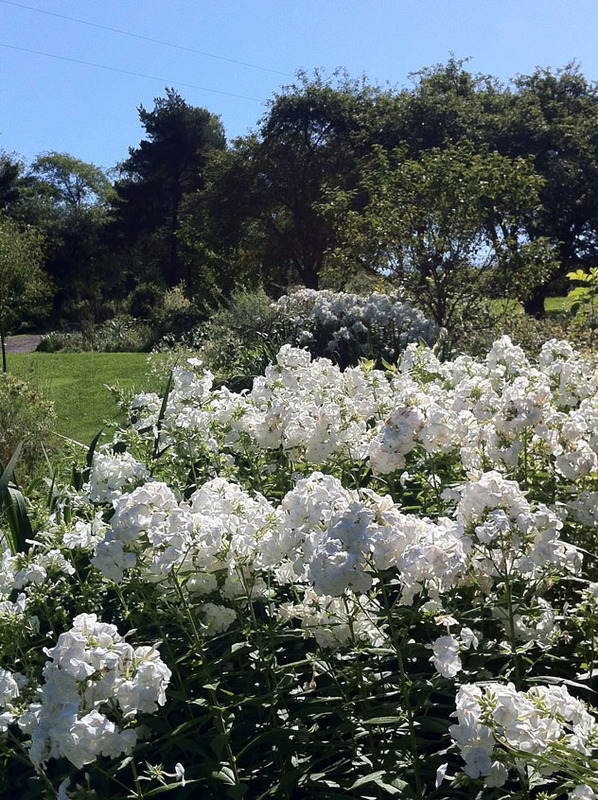 Phlox paniculata ‘David’ was great for eight years, no mildew, with sweet-scented clouds of white flowers in August. But the clumps became so large that I had white everywhere and not enough color. Last spring, I dug out massive clumps and dotted them around the edge of the pond to fight it out with wildflowers such as common boneset, asters and flag iris. It will be interesting to see who wins. Astrantia major (great masterwort) is a European meadow plant and I should have known better, but as it has been appearing in many garden articles and magazines, I guess I was seduced. The white flowering one is the most robust and blooms all summer, but it also chokes out all the plants coming up in ditches and inserts itself into even densely planted areas. Artemesia ludoviciana (‘Silver King’) certainly “kings” it up in any border. In early spring there is no problem, but turn your back and by midsummer it’s either crawling up the rose bush at a great height or rambling into the garden path, overtaking the lawn. The silvery cut leaf foliage is a nice break from the flowering plants, but left unchecked this plant will turn a border silver in no time. Creeping bellflower ( Campanula rapunculoides) was here when we came to this house. You see it growing in ditches and alongside old farmhouses. I have tried to eradicate this plant so many times from certain spots in my garden, but no matter what I plant in its place it not only reasserts itself, but kills the replacement plant. really grow this plant as otherwise it continues to spread at a rapid rate, overtaking everything in its path. 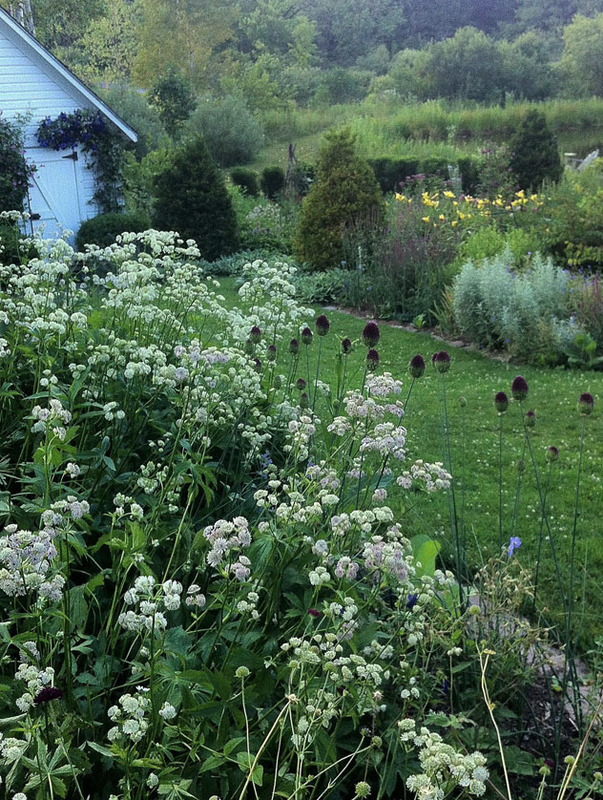 The Dutch garden designer Piet Oudolf in his book Designing with Plants has made it his mission to choose good clump-forming perennials that do not move about by aggressive rooting or seeding. 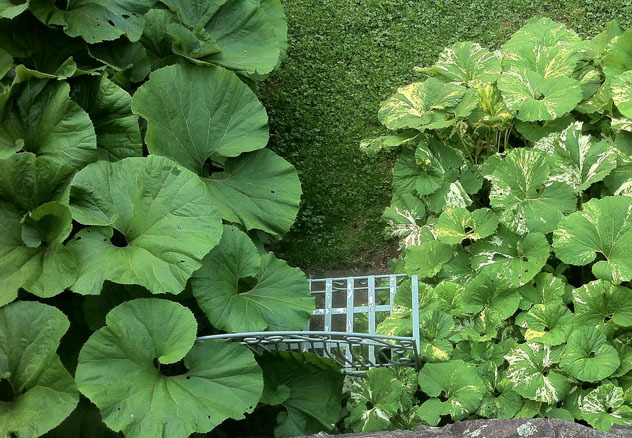 In order for his designs to work, such as the High Line in New York City, plants must stay in their place. Oudolf. with his wife Anja, started a nursery in Holland which allowed him to experiment with perennials. 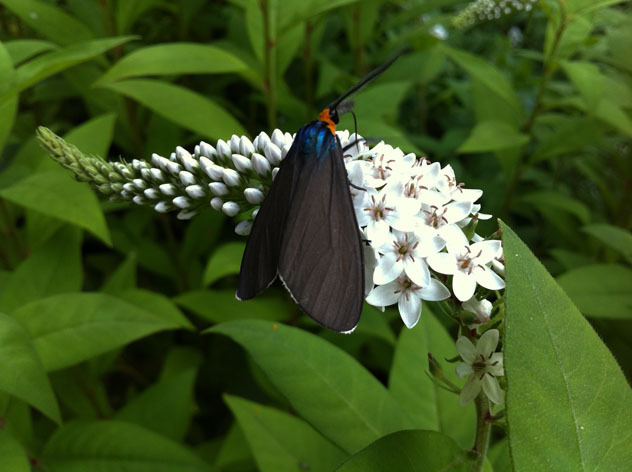 One of his requirements when choosing perennials is that they don’t need to be divided. His hard-earned experience can teach us all how to build a foundation of plants that mix well in plant communities rather than lording it over weaker plants. And you may wish to consider ripping out some of the thugs in your garden in order to make room for some more socially cooperative perennials. Gallery | This entry was posted in Perennials and tagged Alchemilla mollis (‘Lady’s Mantle’), Artemesia ludoviciana (‘Silver King’), Astrantia major (great masterwort), Creeping bellflower ( Campanula rapunculoides), Gooseneck loosestrife (Lysimachia clethroides), Petasites japonicus (butterbur or bog rhubarb)., Phlox paniculata 'David', plants that spread by seed, Plume poppy (Macleaya cordata), thugs in the garden. plants that spread by rooting. Bookmark the permalink. My garden conditions are so challenging, I grow most of your thugs with no problems at all. I’ve heard about Lady’s mantle seeding, but have yet to see a single seedling. I grow Petasites and many other aggressive plants. It all depends on the conditions you offer. It sounds like you are blessed with very good soil. Well James after struggling with hard pan and upland soil- mostly rocks- I am at an elevation of 2,300 feet- I dug out all my borders to 2′ feet and put in good top soil. I have to say many of the plants I mentioned did behave perfectly fine for about 7 years and then all hell broke out! Echinacea ‘White Swan’ stayed in its place for about a decade and only now is starting to seed itself. I wish it would seed more and the others less. I have avoided growing most of the plants you’ve mentioned precisely because I read they were thugs. However, clustered bellflower always had to be coaxed along and finally died out for me. (But I wonder if you actually mean Campanula rapunculoides?) Ditto alchemilla, although I just got a piece from a friend to try again. I don’t have ‘David’, but I do have several other garden phloxes and I think they will all behave as ‘David’ did for you if they have rich, moist soil. They need to be edited, that’s for sure. And Phlox paniculata is actually native to North America, so I wouldn’t be surprised if it held its own against the others at your pond. What I am always pulling out of my beds are asters and goldenrods. Some plants are only meant for very special circumstances, where their strengths can be taken advantage of and their bad points avoided. I really enjoyed this post. 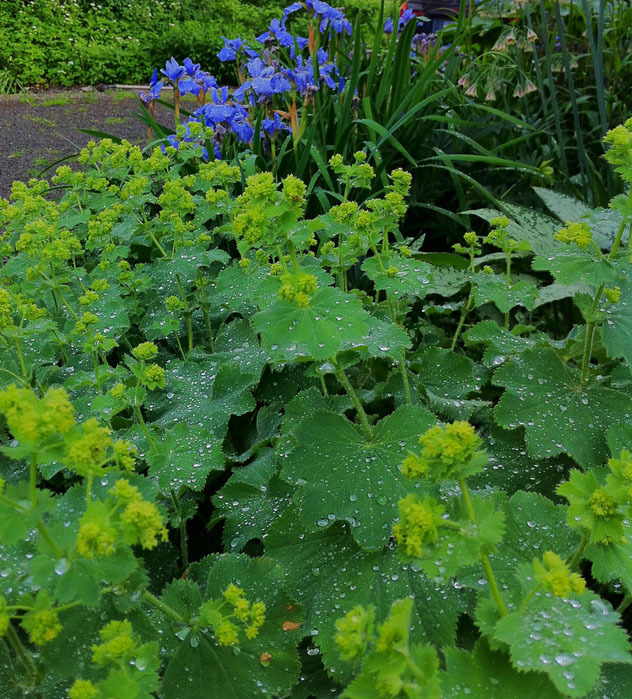 I don’t mind Alchemilla – I have had it for years, and find it very useful as a groundcover under my apple trees. I have a lot of summer phlox, and all of it tends to spread. This year I’m trying a different phlox approach a la Tracy DiSabato-Aust. About 3 weeks ago I pruned the biggest mass of it back by about a foot. It looks less out of control and in better scale with the shrubs around it. Hopefully it will still bloom. I left the plants in the middle of the mass untouched, hoping for a longer bloom period. My worst thug currently is Campanula punctata ‘Cherry Bells’ which has threadlike roots and spreads quickly. At this point I’m just hoping for containment. Also, the native sensitive fern keeps seeding into my beds and is hard to rid of. Deborah, All of the thugs mentioned still exist in my garden. I just control them at this point. ​Well, well, well, I have them ALL!! (one from you:) Great article, though, despite the fact that your beautiful photos make them look very appealing indeed. The concept of gardening without the constant challenge of “rearranging” is very appealing, and I think I’ll buy the book you recommended. Maybe gardening doesn’t have to be so difficult, and the thought of having the plants stay in their place is very appealing. I think I’ll try it —- but not this year!!!!! I love the humor you bring to the subject. Julia, I think its gardener’s nature to keep shifting plants around and I am sure Oudolf does the same even though he has been clever finding plants that stay in their place. Annette- good point about the gate crashers especially during periods of drought. We are having the most unusual summer. April we were in drought with temps near 90 and now for the last 6 weeks nothing but rain and cool temps. I am not really complaining because all the rain has allowed me to edit the garden much longer than normal. I am still transplanting and dividing perennials at this late stage. Have you tried the alpine Lady’s mantle? Mine never seeds itself. I rather wish it would. I wish my garden was as green. We’re even drier than usual. Yes I have it and your right it stays put. This is one of the wettest coolest summers in a while.